Obamacare repeal may be dead, but the GOP lies about Planned Parenthood live on. 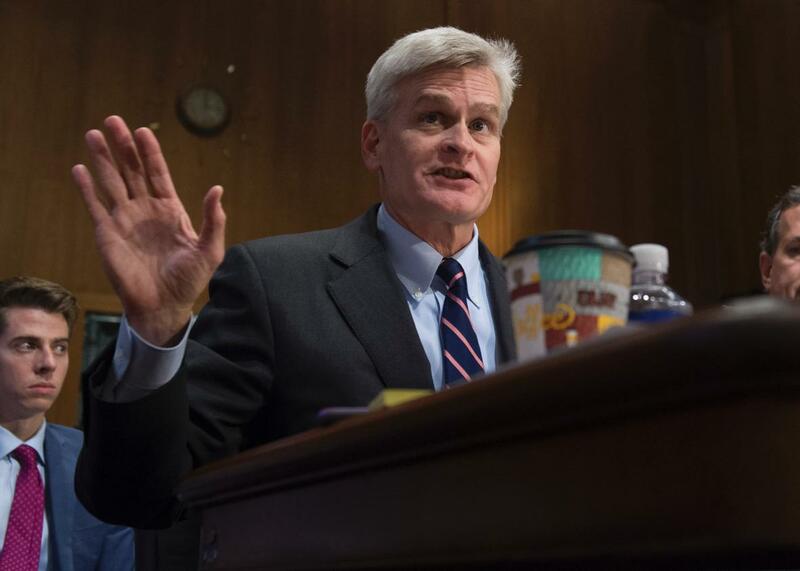 This is the face of Sen. Bill Cassidy, a guy who obscures basic facts about women’s reproductive health care. On Monday night, CNN hosted a town hall where random civilians asked health care questions of four senators: Lindsey Graham and Bill Cassidy, who wrote the GOP’s most recent Obamacare repeal attempt, plus Bernie Sanders and Amy Klobuchar, who appear on most pundits’ lists of possible Democratic presidential contenders for 2020. Seeing as the Graham-Cassidy proposal is just as doomed as its predecessors, the town hall seemed like more of a way to let the Republicans save face than to shore up public support for their wildly unpopular bill. This particular bill might be dead, but some of its provisions will almost certainly rise again. At Monday’s town hall, Graham and Cassidy tried to lay the groundwork for future health care fights in the legislature. Take the prospect of “defunding” Planned Parenthood, which has made it into every iteration of Obamacare repeal that legislators have considered so far. Congressional Republicans have been trying to block Medicaid reimbursements from going to Planned Parenthood for years, putting poor women’s reproductive health on the chopping block to shore up their anti-abortion bona fides. (Medicaid patients are already denied coverage for any abortion care.) Though Graham and Cassidy have witnessed the failure of their latest health care bill, they’re not giving up on their bid to stop Americans on Medicaid from accessing contraceptive services, cancer screenings, and other nonabortion care from Planned Parenthood. In response, Graham invoked the heavily edited videos released in 2015 by an anti-choice group that purported to reveal evidence of fetal tissue trafficking. “A lot of Americans were pretty upset when they saw the videos of selling body parts of aborted children,” Graham told the Planned Parenthood patient. This is a very clever phrasing: It’s true that a lot of Americans were upset, though it’s not true that Planned Parenthood sells or profits from fetal tissue. In fact, after several state-specific investigations and a drawn-out congressional panel that wasted hundreds of thousands of taxpayer dollars, the only evidence of wrongdoings indicted the videographers, not Planned Parenthood. They were charged with felonies in Texas and California for allegedly using fake or stolen identities, inventing a biomedical research company that did not exist, and recording conversations without consent. Planned Parenthood, every investigation revealed, strictly abided by federal and state laws that regulate fetal tissue donation to research institutions. Now, it doesn’t accept any reimbursement for fetal tissue donation at all. Actually, more than half of Planned Parenthood clinics are in rural or “medically underserved” areas, making them critical resources for patients with few other places to turn. And when it comes to contraception care, Planned Parenthood is even more essential. A recent Guttmacher Institute study found that there are about 10,700 health centers that offer free or subsidized birth control in the United States. Planned Parenthood makes up 6 percent of them, but serves 32 percent of all patients who get free or low-cost contraception. The vast majority of Planned Parenthood’s contraception patients—85 percent, or about 1.7 million people—live in counties with either no other source of publicly funded birth control or public health centers that would have to at least double their patient load if Planned Parenthood’s patients could no longer get contraceptive services there. In 26 percent of the 415 U.S. counties that currently house Planned Parenthood clinics, the other health centers that provide subsidized contraception would have to sextuple their client loads to make up for the patients a shuttered or hobbled Planned Parenthood would leave behind. In other words, preventing low-income women from accessing care at Planned Parenthood would force them to travel further to find reproductive health care providers who take Medicaid. And in the short term, forcing patients to switch health care providers to make a political point would cause a possibly dangerous disruption in services. It would take years for any diverted funds to allow other health care centers to scale up and serve a client base that would explode overnight if Medicaid patients got blocked from Planned Parenthood. More likely, those health care centers would never make up for Planned Parenthood’s care at all: Just ask Texas, where defunding Planned Parenthood led to a steep drop in contraceptive use and enrollment in a subsidized women’s health care program. Counties that had Planned Parenthood clinics saw an increase in births by Medicaid patients, who could no longer get their birth control from their neighborhood locations. The world Cassidy envisions, where Planned Parenthood is an urban health care redundancy, is more than a myth or an exaggeration—it’s the exact opposite of the truth.